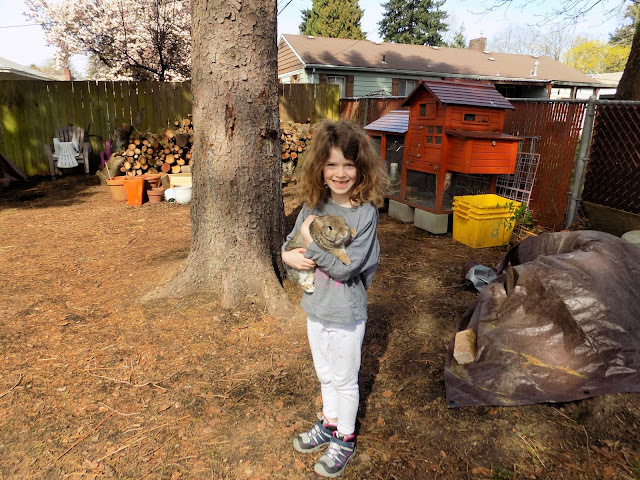 My youngest daughter, Amelia, with our dwarf rabbit, Ernie. I have loved animals since the time I was a little girl, and have always had an inherent desire to protect these innocent creatures. When I became a parent in 2005, I began teaching my son to not harm a living thing, including plants. We would have a spider in the house, and we would gently put it back outside. We would come across an army of ants erupting from a hole in the sidewalk, and we would watch, but not hurt. Once a bird hit the glass of a building we were near, and we put it in a safe spot until it either died naturally or the stunned state faded and it was able to fly again. My girls were born in 2007 and 2011, and since the time the kids were little, we have always had backyard chickens. Later, we adopted Pepper, our cat, and a couple of years later, we adopted Burt and Ernie, our rabbits. The kids have grown up with pets around, and no matter what, we take our job as their caregivers seriously. It makes me happy to see that the kids now possess an inherent love of animals, it's a part of who they are now. Being taught from a young age to not harm a living thing has taught my children to lead lives that demonstrate kindness (not cruelty), love (not hate), and tolerance (not intolerance).